Karachi: Five more people have lost their lives in on going violence in Karachi. According to police a body of young person found from Orange Town sector 11. The victim was kidnap and later shot to death. Mean while, One more body was found in Manghopir area Which was to death. A man was also shot dead near Ayesha Manzil while another was killed in buffer zone. 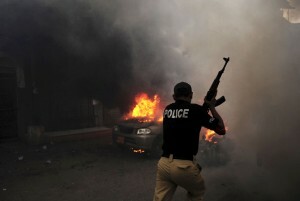 Karachi violence going worse day by day. On Saturday,violence claimed 20 lives including one police office bearer of Ahl-e-Sunnat Wal-Jamaat. Earlier on Sunday,twelve innocent people have lost their lives in different incident of violence and firing. a father and his two son were died in Sunday violent incident as they were shot to the death.The target killing violence have taken 100 of life in 10 days. Four armed motorcyclists attacked on victim, they spread bullet as victims were sitting near their home in FC area in the limit of Sharifabad Police station. Victims were taken to the Abbasi Shaheed Hospital. IB Officer Qamar Abbas Naqvi was gunned down about three month ago also in the same area in a sectarian attack. During Funeral procession of Asad Abbas Naqvi was heading towards Wadi-e-Husain graveyard located at super highway, a reporter of news channel and three other were injured during cross fire between the Shias and ASWJ activists near Sohrab Goth . A young man yet to be identified was found dead from Sharafa bazaar in Kharadar area. Police said that victim was kidnapped and later shot on head and his body was dumped at a dessert place. The police and other forces trying to control the situation. IG police Fayyaz Leghari said that the police and rangers are working hard to maintain law and order situation in the city. He also said that during the raids in various areas, police and rangers arrested four suspects who are activists of banned outfits. IG police also claimed that two target killers and two extortionists were also arrested. He also included that three accused were also arrested in Hyderabad. IGP Fayyaz Leghari said that additional police officers have been deployed in city and situation will soon be brought under control.